ATLANTIC CITY, N.J. (AP) — Elvis Presley’s Rolls Royce, the suits the Beatles wore on their first tour of America, Bruce Springsteen’s sleeveless faded denim jacket and colorful headband, and Michael Jackson’s famous glove are among the items of music memorabilia on display at Atlantic City’s new Hard Rock casino. 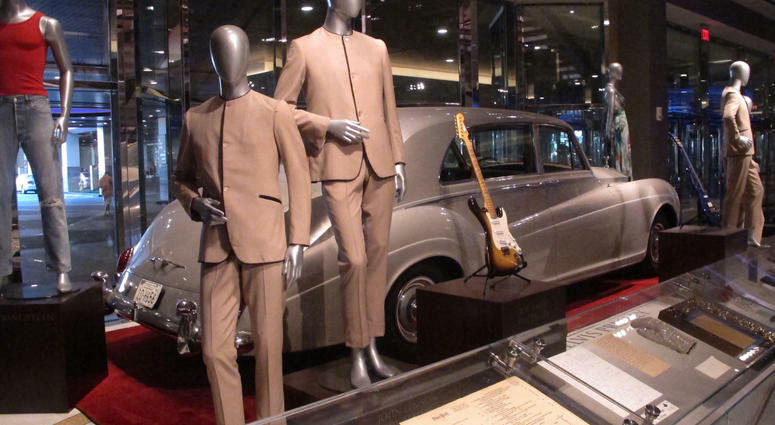 When the Hard Rock opened June 28 in what used to be the Trump Taj Mahal, the casino opened in 1990 by Donald Trump, it brought with it a large display of items from what it calls the world’s largest collection of music memorabilia. There’s a state of New Jersey accident report involving Springsteen, a purple guitar played by Prince, and John Lennon’s handwritten lyrics to “Imagine” on a fading piece of white lined paper. Then there’s The Glove, the iconic sparkly hand covering Michael Jackson made famous in his videos and concerts. It was donated to Hard Rock in London by Jackson himself, said Giovanni Taliaferro, Hard Rock’s director of memorabilia. The company obtains its music memorabilia in a variety of ways, including direct donations by artists or purchases at auctions. Sometimes Hard Rock will make a donation to an artist’s charity in return for a piece of memorabilia, he said. An upstairs room is devoted to New Jersey artists including Springsteen, Bon Jovi, Debbie Harry of Blondie (it includes her handwritten lyrics to “Dreaming” scrawled around a poster of herself), as well as Frank Sinatra, Whitney Houston and the famous Stone Pony rock club. Still to arrive at the Atlantic City Hard Rock are items including a Hendrix guitar, Frank Sinatra’s piano, and the shoe-shine chair that James Brown used as a 12-year-old.